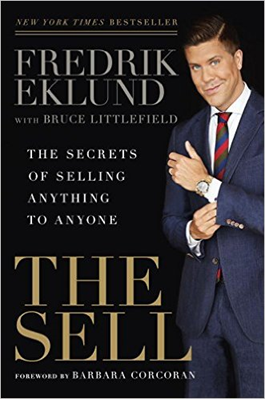 The Sell is a self-development book written by the top Real Estate agent in New York, Fredrik Eklund. He gives insight and advice on how each of us “Sell” ourselves. Although he sells real estate, this book is not written for real estate agents alone, it is for any and everyone who wants to succeed. I love inspirational books; it is my favorite genre. I realize now that is because it is also my purpose to inspire, so it connects to something in me. I enjoy many inspirational classics but I also enjoy some of the newer modern books as well. This book is very down to earth with practical advice that anyone can use. Fredrik is so transparent. I enjoyed how he shared both his professional and personal life with his audience. I learned all about his rise to stardom, and felt like I was along for the ride! I also appreciated the fact that Fredrik was honest and proud about his lavish lifestyle. He clearly stated that life was about more than material things, but he also makes no apologies about the lifestyle that he has EARNED for himself. I typically read books very quickly, however with The Sell it was like an extravagant meal, I wanted to savor every moment. So it took me about a month to read it. I really enjoyed all of the personal pictures and memories that he shared in the book. And I adored the love story he told about him and the love of his life, his husband Derek. He starts off by telling us the story of how he came to the United States. He visited New York on a trip with his father and brother when he was only 10 years old. He fell in love with the greatest city on earth instantly. And when he returned years later as an adult, he started from scratch to build the life he desired in New York. He did not know that he would become a real estate agent, much less the most successful agent in the city. But he knew that he had a dream in his heart and that he was going to find a way to fulfil it. This reminded me of myself. I have always known that I wanted to do something great, but I did not know exactly what it was nor did I know how to get it. Over the years I honed in on my interest and determined the career that I wanted. After that I had to figure out how to get it. Honestly, I am still in the latter process of figuring out how to accomplish my dreams. I am on the right path and it becomes more and more clear every day. Actually, I got the idea for my blog from Fredrick. I knew that I wanted to build a platform for my message, but I didn’t know exactly what it would be. It wasn’t that he suggested starting a blog, but he talked about blogs, social media, reality TV and other options for building your personal brand. For some reason the idea of a blog connected with me. That was the beginning of this year, and here we are 5 months later talking to each other on my blog! Be The Authentic You – Forget selling, begin by finding yourself. He talks about being your authentic self and being comfortable in your own skin. He also talks about being able to handle “No.” You have to accept the No’s and know that if you are living an authentic life, then your yes will come, and it will be worth the wait. One of his tips for being yourself is to find your trademark. His trademark is his high kick. He calls his audience “high kickers” throughout the book, and now I consider myself one! One of my trademarks is my gray hair. I grayed early and at first being only 30 and graying was not exciting. But now it has grown on me and I like it. People are always baffled by the fact that I have salt-n-pepper hair with a baby face. It has become my trademark, and I wear it with pride! Motivation – Next, he advises that you figure out what drives and motivates you. I can tell you that helping women to accomplish their goals and achieve a better standard of life for themselves is what drives me. And what motivates me……………..is money! Shadow a winner – This was already a strategy of mine. I have been looking for examples of the woman I wanted to be all of my life. Most of my examples have been public figures that I looked to for inspiration. I also have some examples in my real life. In my post “40 I’m A Real Woman Now” I give advice to surround yourself with the right people. Fredrik’s advice is even more specific, he is telling us to find a winner in your industry and shadow that person. I am doing that now. It took me a while to find an African American woman who was a C.E.O. in the non-profit industry, but I finally did and I work under her now. She is also my Mentor/Coach. And as a bonus through her God brought me another African American woman who is a former C.E.O., and I am also working under her. Dress the part – Okay, this is one of my favorites. Many people do not realize how their appearance is affecting them. Fredrik advices us to use our looks as part of our charm. Being a Social Worker I can tell you that A LOT of people in my field do not care anything at all about their appearance! Some of them are high and mighty and think that caring about your appearance and material things is unimportant compared to the problems that our clients are facing. Well as I will share with you in a future post called “Not the average Social Worker, I am no Mother Teresa” I do not believe in denying myself in order to help others. Looking and dressing the part of the person that you want to become is very important. Expand your reach – Fredrik discusses the importance of utilizing social media to gain attention and reach your audience. I must give credit to Fredrik for persuading me to utilize social media for my blog. I was not on any type of social media. Now I am on Facebook, LinkedIn, and Twitter. I use them as marketing tools to build my brand and to reach my audience. Many people have tried to persuade me to join social media, but I always refused. So, Fredrik you got me to do what many before you could not! I cannot review the entire book for you, but I would advise anyone who wants to build any kind of public persona to read his book. Actually, I encourage anyone trying to improve their life to read his book. I felt like Fredrik was talking directly to me. That is one of the fascinating things about it, he finds a way to touch his audience in a personal way. This Swedish, gay, millionaire, real estate agent in New York connected with me, an African American straight woman, who is a social worker from Detroit………….that wants to be a millionaire! That goes to show you that authenticity has no boundaries. I love Fredrik and I hope to meet him someday. He is a “friend in my head” as Wendy Williams calls it! I would like to thank him personally for sharing his life with the world and for helping me to find a way to make my dreams come true. Thank you Fredrik! What is a book you have read that has helped you? Share your thoughts with me below. I would love to hear from you!